The first team continued their unbeaten start to the new season with a comprehensive win over Tara in the Murphy Cup on a score line of 2-10 to 0-9. Best for Eire Og on the day were Pat Tobin, Ronan Campfield and John Bradley. This weekend the first team play Harlesden Harps in the Murphy Cup at Downhills on Saturday 28th April, throwing in at 2.30 followed by Neasden Gaels in the Cup the following Tuesday, throwing in at 7pm. All support welcome. Training continues this week on Monday and Thursday at our home pitch, Downhills Park starting at 7pm. The first fundraiser of the season will be on Saturday 28 April in the Sheephaven Bay pub Mornington Crescent, starting at 7.30. The annual Golf Classic takes place on Saturday 23 June 2018 in Trent Park Golf & Country Club. If there are any companies/businesses out there who would like to get involved in sponsoring a hole or tee, please get in touch on the below contact number or contact either of our social media pages. For further details please contact: Nigel Drew 07785 792561. 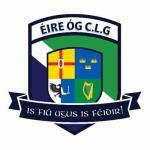 The club would like to congratulate both Mike McDonagh and Sean McGrath and their respective partners on the recent birth of their daughters; two great additions to the Eire Og family. New players are always very welcome to join our friendly club. We have two adult teams, Intermediate and Reserve. We are based in Haringey, North London; the club covers a wide area and current players live in many different areas across London, including, Islington, Angel, Finsbury Park, The City, Hackney, Shoreditch, Holloway, Camden and Tottenham. Transport to and from training and pick-up from stations can be arranged, if required. If you would like to join our club, please do not hesitate to contact us on Kerry O Donnell on 07216 98588. We would be delighted to hear from you.